First State Bank Celebrates 30 Years of "Ag Strategies"
The first thing you notice at every "Ag Strategies" dinner is all the bank staff lined up at the front door in their fresh looking "First State Bank" shirts with a friendly handshake and a welcome, the minute you step in the door. And then the friendly ladies of First State at the receptionist tables asking for you to sign-up for a door prize, and later handing you a gift. The third year at the winery in Carthage offers a much roomier and airy venue with many buffet lines allowing almost everyone to be served within a short time. "First State Bank" had at least a decade of photos from past "Ag Strategies" events rotating over a big screen while people visited and enjoyed the roast beef-ham dinner catered by the winery. A First State marketing display explained the offerings at the bank. Master of Ceremonies Andrew J. Bastert "Andy" is First State's Western Illinois Regional President. Andy invited everyone to come to an upcoming Crop Insurance meeting. He also explained that "First State Bank" was 90% loaned out. "It means we are challenged to ramp up deposits so we can loan more." Bastert said, the loan/deposit ratio is what makes a community bank. After the business of banking, Bastert began the program with a sentimental poem called "The Farmer" which reminded him of his father. He showed a video that was aired by the late conservative radio broadcaster Paul Harvey that has probably been heard before by those in attendance, but, "it bares repeating from time to time" he said. This decades-old speech from Harvey who passed away in 2009 became a major topic of chatter when it was condensed and delivered as the audio backdrop for a Ram Trucks ad during the second half of the Super Bowl Sunday. And on the 8th day, God looked down on his planned paradise and said, "I need a caretaker." God said, "I need somebody willing to get up before dawn, milk cows, work all day in the fields, milk cows again, eat supper and then go to town and stay past midnight at a meeting of the school board." "I need somebody with arms strong enough to rustle a calf and yet gentle enough to deliver his own grandchild. Somebody to call hogs, tame cantankerous machinery, come home hungry, have to wait lunch until his wife's done feeding visiting ladies and tell the ladies to be sure and come back real soon -- and mean it." God said, "I need somebody willing to sit up all night with a newborn colt. And watch it die. Then dry his eyes and say, 'Maybe next year.' I need somebody who can shape an ax handle from a persimmon sprout, shoe a horse with a hunk of car tire, who can make harness out of haywire, feed sacks and shoe scraps. And who, planting time and harvest season, will finish his forty-hour week by Tuesday noon, then, pain'n from 'tractor back,' put in another seventy-two hours." God had to have somebody willing to ride the ruts at double speed to get the hay in ahead of the rain clouds and yet stop in mid-field and race to help when he sees the first smoke from a neighbor's place. "Somebody who'd bale a family together with the soft strong bonds of sharing, who would laugh and then sigh, and then reply, with smiling eyes, when his son says he wants to spend his life 'doing what dad does.'" After Bob Rhea listed the top ten ag strategies, which were listed in last week's Quill, he introduced feature speaker Orion Samuelson, acclaimed "Voice of Agriculture". His speech was entitled: "You Can't Dream Big Enough" and focused on his new book to the youth about the value of farming and an agriculture education. 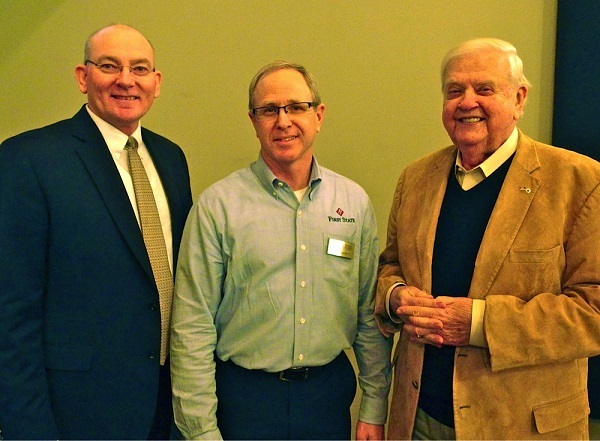 Speaker Bob Rhea-tax expert and consultant, with Andy Bastert (center) First State Bank MC, and feature speaker Orion Samuelson, for the special 30th Anniversary of the event.